Sit in a room and read — and read and read. And read the right books by the right people. Your mind is brought onto that level, and you have a nice, mild, slow-burning rapture all the time. This realization of life can be a constant realization in your living. I have been waiting for that rapture, the realization. Navigating adulthood was a struggle in itself, and there came a time when I wasn’t even sure I knew how to move forward in different aspects — career, family, relationships, even friendships. But the hardest of all to grapple with? Finding my purpose, and living my own truths. Saying it can be quite easy, but it requires so much of one’s self that it can be daunting. I know that it requires time, honesty, patience and most of all, compassion. It asks the self crucial questions that can be painful, and it forces the necessary alignment of what we genuinely seek with what we’re currently undertaking. In a society driven by consumption, fueled by fear and an insatiable desire to be/have/do more, there is barely enough time to reflect on these things. Not to even sit. To sit in silence, and be reminded of the depths of our own consciousness, to fully trust that the knowledge we seek has been there all along. The place to find is within yourself… There’s a center of quietness within, which has to be known and held. If you lose that center, you are in tension and begin to fall apart. His words are reminiscent of Rainer Marie Rilke’s in Letters to a Young Poet. Before getting up from bed on Tuesday morning, I read the first letter dated February 17, 1903 and in quite the most humble way and gentle way, Rilke prodded the young Kappus (and me): There is only one single way. Go into yourself. These words feel so good to hear, so affirming. And yet I have nary a clue on how to materialize them, and all I feel is a gaping hole of what-I’m-supposed-to-be as opposed to who-I-am-now. Perhaps this is why Campbell appeals to me greatly, because while I’m still searching, making my own map(s) and figuring things out, I know I have some guidance. Stay with it, no matter what people tell you almost feels counter-intuitive, having brought up in a culture that both forces you to conform and shames you for being different. Hundreds of years of colonization has weakened the collective self-hood of my (Filipino) people, and it takes extreme courage and will to rise above that. Drawing from mythology and philosophy, I was repeatedly in awe of beliefs that Campbell discussed at length, from religion to daily rituals that almost seem mundane. From Jesus’s ascension to heaven to judges wearing black robes, he broke all of it down — the connections, the context. It was enlightening, refreshing. Like having your mind filled up to the brim and then feeling it expanding, your consciousness opening up beyond your own imagination. All of it made sense, even if it was the first time hearing it. I’ve been trained (academically and professionally) to understand why and how things operate, and at times I could be stubborn without the answer. What Campbell teaches me is that I can have the answers and still be present with what I don’t know. Bright faith, if you will. On the first day of the year, I ventured out closer to the coast with a couple of friends. It’s been the coldest winter I’ve ever experienced in the Bay and heading out to the beach may seem like an odd way of spending January 1st, but we all knew that we needed to be grounded. Salt and sea are elements my friends and I strongly believe in, and with the addition of Campbell’s wisdom the year would start off right. The sun was out and the sand felt unexpectedly warm between my toes. I sat in awe of the magnitude of the ocean, of the good weather that befell us that day. We were all giddy and in the best spirits, as we slowly let the worries of the past year go. Afterwards, we sat in silence for a long time. I still have a lot of questions. I’m still unsure about a lot of things. In spite of these, Campbell taught me two valuable things: how to trust earnestly, and to love the process as much as I can. 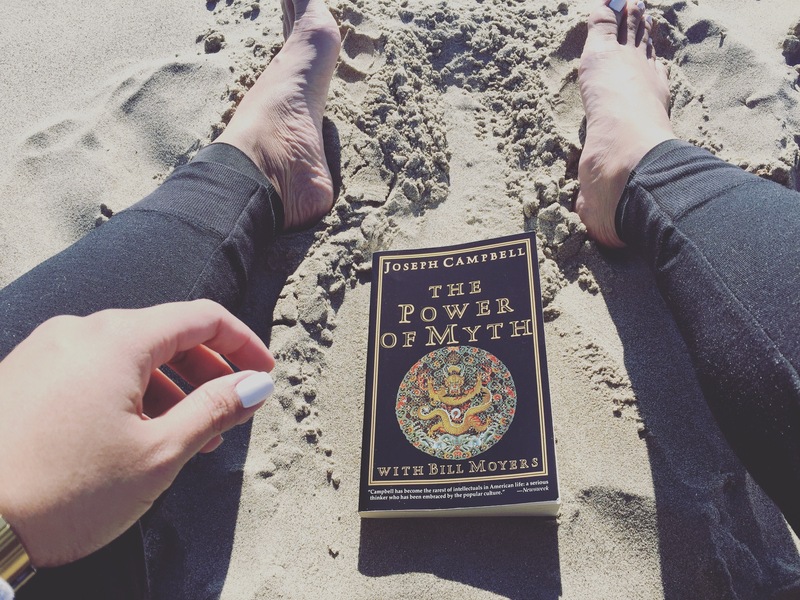 Have you read or have been inspired by Joseph Campbell? I want to talk to you!